I have been enjoying Due over the past three weeks. I really like the app. Not just because it's really fast to load and has a great natural language processing support, but mainly because it has a great support for x-callback-url. This is an example of the common use case I have for jotting down multiple reminders in a single seating using Drafts. Open this link if you want it installed on your iOS device automatically. If you want to learn more about the technique I used here, please refer to my previous workflow on adding multiple events to Fantastical. If this is the first time you use an x-callback-url to add reminders to Due, you need to understand that you need to manually tap the title bar in Due twice for each reminder. The first tap is required to set the date and time of the reminder. The second tap is optional. If you tap them, the date/time information will be removed from the title, otherwise it will stay as is. Once the reminder has been added, Due will show a popup asking you for a permission to go back to Drafts, according to the x-success parameter. If you don't allow it, the chain of actions stops immediately. While the above action works perfectly for most batch data entry cases I have, there is one use case that I feel the need to create a specific action. It's one of those use cases where you may need to be reminded of the same thing more than once in a day for the next few days. This is especially crucial if it's a new habit that you need to form, e.g. a temporary medication schedule that you need to adhere. Many people are required to take several different pills when they get sick. Each of these pills may have different schedule. For example, some of them may need to be taken twice a day, while others may need to be taken three times a day. Some may need to be taken an hour before you have your meal, while others may need to be taken after you've had your meal. And, what makes it difficult is this is a new habit that needs to be installed for a few days - and be discarded once our health condition is back to normal. This is the most intuitive way for me to jot down the information for the daily medication reminders I need to setup in Due. For cases like this, I find creating a post in Drafts containing the name of the medication as the [[title]] and the times of day as the [[body]] to be the most intuitive way to put the information down. The only thing left is how to create a custom URL action to convert this post into multiple repeating reminders in Due. To do this, I created two custom URL actions in Drafts. The first one is called Daily Medication Reminders. This action stores the [[title]] into the [[clipboard]], and parse the [[body]] into the next action called Merge Clipboard to Due. The idea is to take the medication instruction, such as the types of pills, and put it into the clipboard. Then, using the same technique as a mail merge, I'd combine the clipboard content with the times of day. This action uses the same concept as the Add Reminders to Due action above. It will recursively call itself until there are no more times of day to be added to Due. 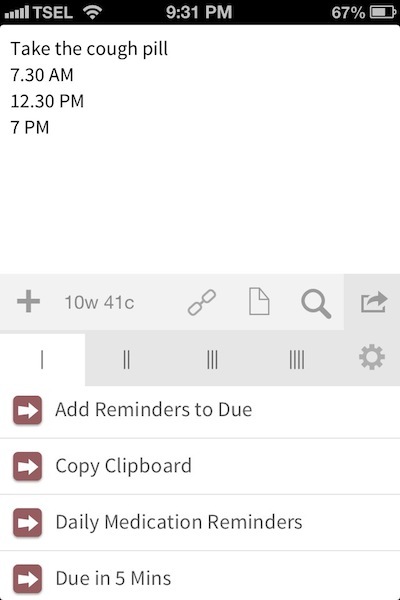 For each of the reminders, it will combine both the time and the medication instruction previously stored in the [[clipboard]], and save it as a daily recurring reminder. Adding medication reminders is just an example that many people can easily use it for. Feel free to reuse this action to fit your use cases. Simply rename the Daily Medication Reminders action into a more contextual name, based on your use case, and you're set to go. You don't need to rename the Merge Clipboard to Due action. To find my other workflows, please visit my Productivity and Workflows blog.